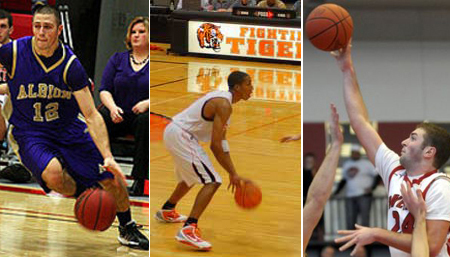 Left to right, Chris Hutton, Damon Franklin and Nate Cox. How can this be possible? These two local class A districts are the most lopsided I’ve ever seen. Flint Northwestern gets to stumble blind-folded to a district championship, while a team like Flushing, which actually beat Northwestern, is the second-worst team in its district. Honestly, is any attention paid to parity anymore? 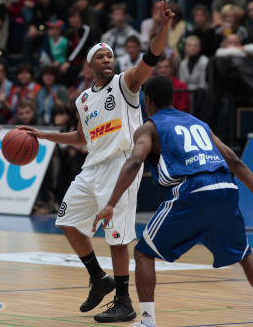 Greg Burks retired from basketball after a productive pro career in Germany. Because he’s never been the biggest guy on a basketball court, Flint Northern grad Greg Burks has spent his basketball career proving people wrong. Out of high school, he ended up going to small Prairie View A & M where he turned himself into one of the best guards in the country at that level. 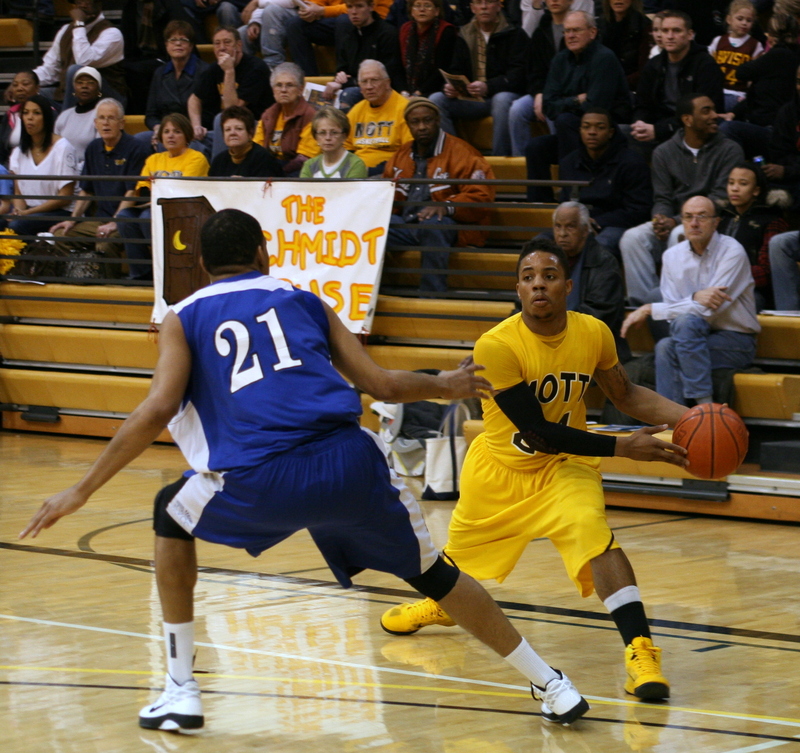 His standout college career turned into a successful pro basketball career spent in Germany. Mott's sophomore point guard Demetrius Miller scored 18 points in the state championship win. FLINT, Michigan — No. 1-ranked Mott Community College won its third game in four days on Saturday night, winning the JUCO state championship in a rout over Kalamazoo Valley, 83-55. Mott was led by sophomore guards Sam Burton, Demetrius Miller and Marshawn Norris. Burton set the tone for the game in the first half, scoring nine of his team’s first 11 points. Burton finished with 21 points on nine shots, five rebounds and three assists. Miller did much of his damage in the second half, finishing with 18 points. Marshawn Norris, at all of 5-10, had a game-high nine rebounds to go with his 10 points. Mott led by 17 points at the half and shot 54% from the field for the game. Ken Gordon led KVCC, the champion of the MCCAA Western Conference, with 14. The teams will now enter the regional playoffs after a first round bye. They will play on Friday night at home. The regional playoffs are broken down into two regions, so there’s a chance the two teams could meet again in the national tournament if both make it. Mott will have a quick turnaround after beating Kirtland 70-59 last night on the road in Mio. The Bears will host Kalamazoo Valley, the top team from the MCCAA’s Western Conference starting at 3 p.m. Listen live online at MRSN. Demetrius Miller to Doug Anderson during Mott’s win over Schoolcraft College Wednesday night in Flint. If not, it’s certainly the longest alley-oop I’ve ever seen. Last night, Mott sophomore Demetrius Miller hit teammate and fellow sophomore Doug Anderson with an alley-oop from three-quarter court. Update: Anderson’s dunk made Sportcenter this morning. His was the #2 play of the night. FLINT, Michigan — No. 1-ranked Mott Community College is now 26-2 on the season after a 92-54 win over Schoolcraft on Wednesday night in Flint. The Bears shot 50% from the field for the game and put five players in double-figures led by Sam Burton‘s 18 points, five assists and four steals. Demetrius Miller added 11 points and five assists. Karl Moore led Schoolcraft with 16 points and six assists. Mott returns to action on Friday night against Kirtland. Bentley senior Brendan Green broke the school record for scoring last night, pouring in 41 points with 14 rebounds in a win over Morrice. Morrice, shockingly, lost by 19 to Bentley after upsetting Flint Hamady last week.